As I wrote previously, TED Active certainly was. In fact, it was exhausting. With about 50 different talks during the week (starting as early as 8:15 a.m. and running through 7 p.m.) it was difficult to keep up. 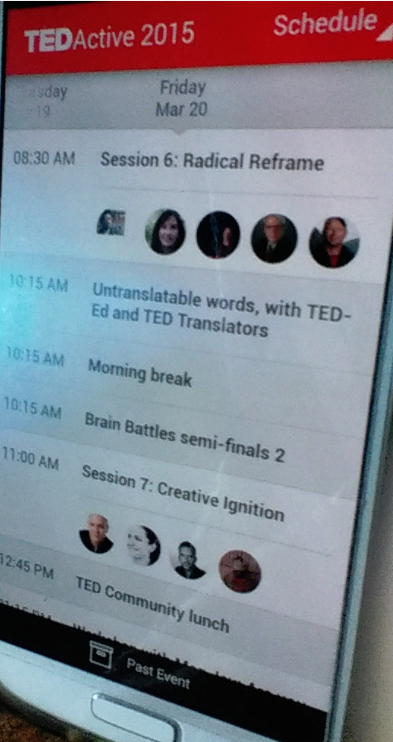 I’m fairly sure not everyone managed to catch every talk. A few days I ago I received a link to the unedited talks so I can watch the ones I missed. On Tuesday (3/17) there was an opportunity to sign up for a fifteen-minute salon* on Thursday to either give a talk or curate* one. I really hadn’t intended on presenting anything myself but I went ahead and signed up. I wasn’t really sure what I was going to say, but I’ve given talks on our metric system problems before—just not to an international audience—and would need a different take on what message I wanted them to leave the presentation with. Name badges (with photo) were scrupulously checked every time you entered the venue. They included a sensor that was read electronically. Those who had signed up for the salons (there were five of us in all) received an email late Wednesday that if we wanted to have visuals, we needed to get them to the coordinator by 6 p.m. that evening. By the time I got back to my hotel room, I had about an hour to pull something together. I was able to grab images I’d used for previous presentations, so I hurriedly pulled together nine slides including a cover slide titled: The United States and Metric System Adoption: What’s the Deal? I managed to submit them with 20 minutes to spare. I was the first person to talk during the session and the audience had grown to about 30 people by the time I finished. My final slide was a call to action: If you’re American, please be aware of our situation and help us move toward metric adoption. If you’re not, please stop enabling us. If you are really worried about us “not getting” a weight or measure, don’t include our measures. Instead, use the metric measure and then tell us it’s “about the height of the Eiffel Tower,” or “about the weight of three medium apples,” and take away our crutch so we better realize we’re out of step. When I’d finished, the reception was quite warm. There were three zones to watch the streaming TED talks, the auditorium (cell phones off) and area outside of the auditorium (where I spent most of my time) and the lobby where talking was allowed. At the end of my presentation I did have time for questions. The first one I got was “How long did you think it would take to convert?” My answer, based on various things I’d seen over the years, was that five years was a reasonable time frame. Another person mentioned the fact that we destroyed a Mars orbiter back in 1999 due to the confusion of two teams using both metric and U.S. customary measures. It literally crashed into the surface of the planet. I’ve updated the full costs associated with the mission and it comes close to a $1 billion dollar loss. I did specifically ask for feedback from someone who was in the audience for my whole talk. He told me he’d coached people for TEDx talks and the only thing he’d change was the visuals. Hey, it was the best I could do in less than a hour. 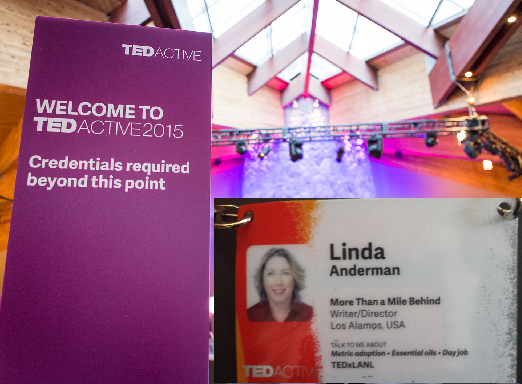 I recently spent almost a week at TED Active and it was pretty amazing. Not just the talks but also the people who attended. If you’re not familiar with the TED format, visit TED.com or check your Netflix listings. In essence, they are short talks (mostly under 18 minutes) that emphasize communicating directly with the audience with the use of minimal “slides.” The subjects can be almost anything, but “ideas worth spreading” is the main thrust. The new and innovative are the order of the day for attendee/presenters like Bill Gates and other leaders. I was able to go to TEDActive as a previous TEDx (an independently licensed TED) event organizer. 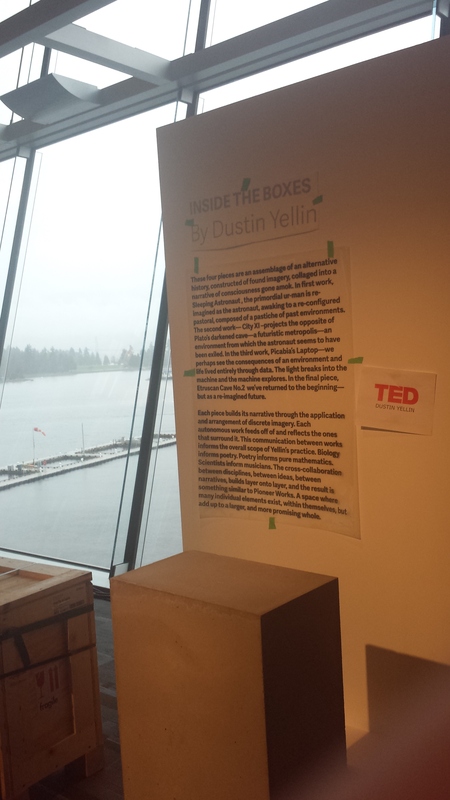 As such, myself and a couple of hundred TEDx-ers arrived on Saturday, went to workshops on Sunday and were then transported from Vancouver (where the main TED event was slated to begin the next day) up to Whistler, B.C. Canada for our parallel activities. 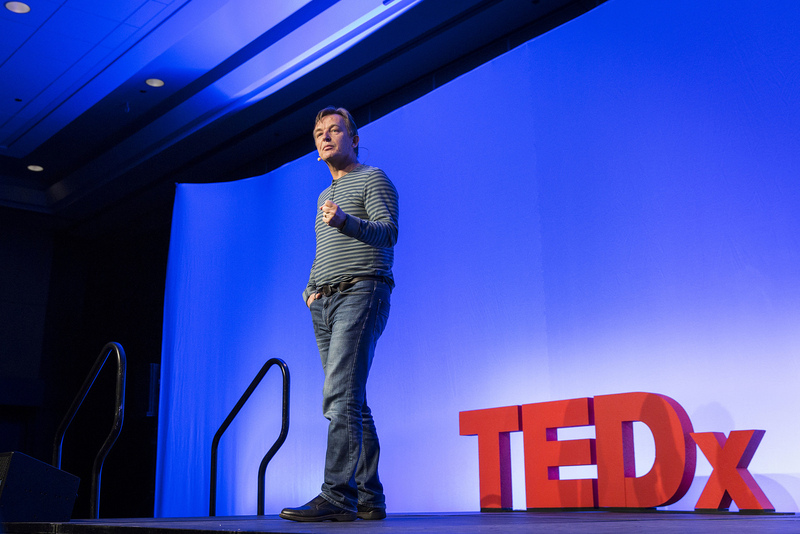 Chris Anderson (TED curator) addresses us in Vancouver on March 15. During our Sunday in Vancouver, Chris Anderson (the curator of TED) gave us a presentation on various aspects of TEDx in the auditorium where the TED event would kick off the next day. He had asked for feedback on the venue and I had an observation I was going to email him. Then, lo and behold, I saw him a meter away from me so I stopped to share my comment in person (the observation itself had to do with the side screens behind the speakers). I then introduced myself and gave him the More Than a Mile Behind business card, saying that I was working on a history of the metric system in the United States. “Does it have a history?” or words to that effect, was his response. I started to give my Thomas Jefferson line about our dimes and pennies, but some other people came up and his attention went elsewhere. 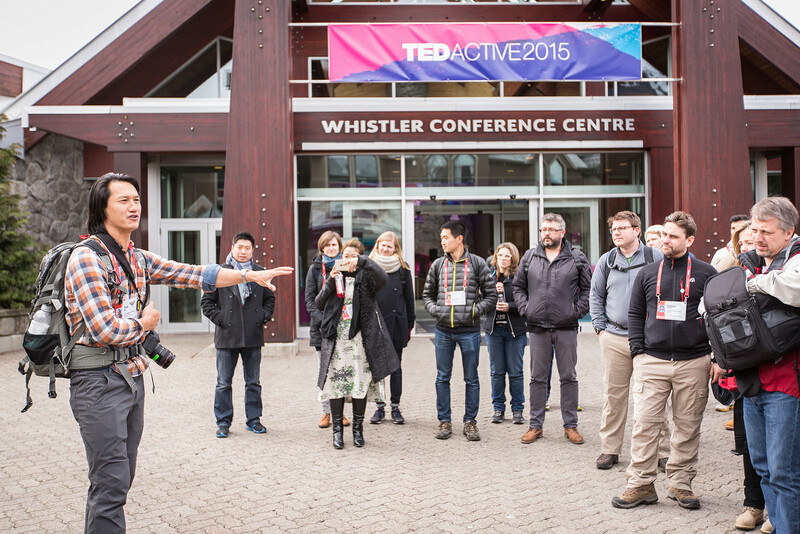 Where TED Active met in Whistler, B.C. 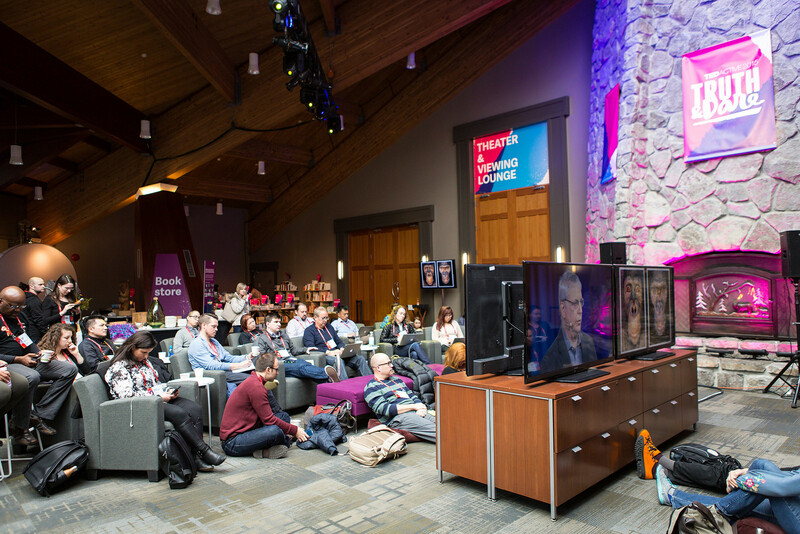 TEDActive had its own venue in the conference center, complete with giveaways, food and a live stream of the talks from Vancouver with periodic shout outs by Anderson. Activities were scheduled every day from break of dawn to 10-11 p.m. with the talks starting around 8 a.m. While I was there, I met people from all over the planet. Later in the week, there were presentations about potentially great things on the horizon but that might eventually lead to our doom. He asked the audience to respond. Every time there is change on the horizon there is talk of the doom it will bring. This has been going on for centuries. As in the past, progress will bring the negative with it but overall it will be for the good. I wouldn’t want to go back prior to the industrial revolution (for one example). There’s more but it will need to wait until next week.